So I run an openID enabled wiki site based on the excellent ikiwiki software called webconverger.org. 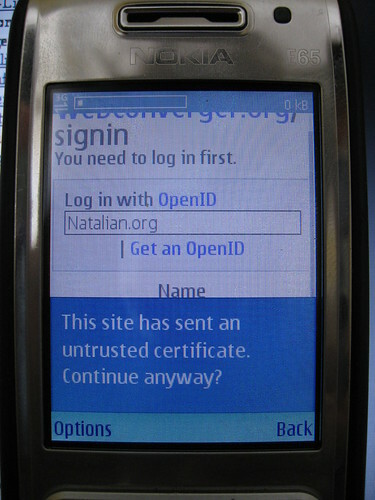 So how do they work with the mobile browsers on my ageing Nokia E65? 1&4 incidentally asked for confirmation with the myopenid.com’s certificate. I think there is an usability bug by having to type in one’s openid url, as none of the browsers seem to cache previous form fills for quick auto completion. Also it would be nice if I could have some sort of shortcut to submit the form like [Enter] does on my desktop browser. Once logged in and the cookie session magic is are all there, OpenID is a dream. However I am wondering how the SIM or hardware of the mobile phone could perhaps skip the step of entering the password in and make it more secure. I assume the mobile browser needs some sort of interface to the SIM. I wonder how to realise this. Do check out the screenshots I took of my testing session.